Stylish. A conversation piece that can’t be beaten for adding interest and high-end panache to the bathroom. Versatile. Usually bowl-shaped, they are also available in rectangular shapes—both boxy and with flared edges—as well as in swooping sculptural and nature-inspired shapes. Depending on the material used and the faucet selected, they can skew toward primitive or modern, sleek or substantial. It can be mounted above the counter or partially recessed. Imaginative. 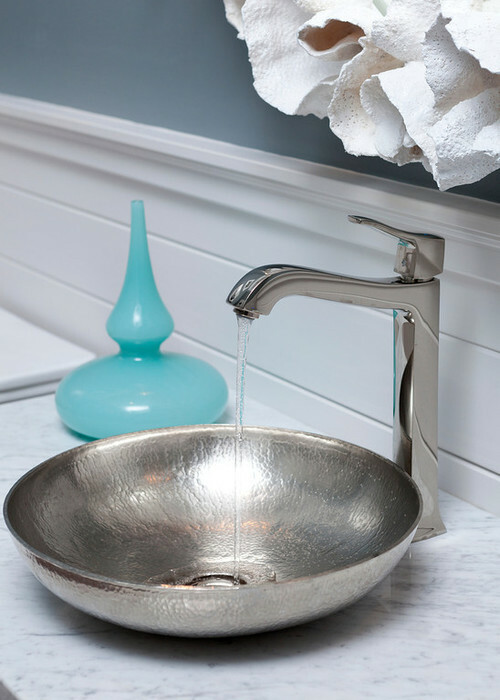 Some designers and homeowners re-purpose vintage basins, pottery, and even galvanized buckets. These basins also afford the opportunity to re-purpose vintage, unique, or much-loved pieces of furniture as vanities. The faucet you select also affects the final design. Changeable. Easier to swap out than an undermount sink, which is typically wedged and sealed beneath the countertop. This way if you tire of a glass one, your plumber or contractor can more easily swap it out for one made of a different material. Today they come in brushed nickel finishes, copper, concrete, glass, porcelain, natural stone—the options are really endless. Comfortable. If consideration is given to the height of the person who will be using the sink, this sinks can prove to be more ergonomic. 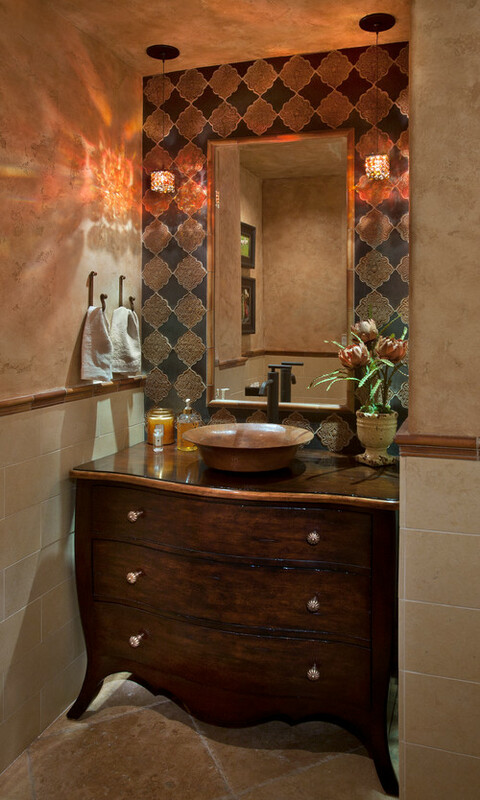 Most traditional bath vanities are between 32 and 34 inches tall. A vessel sink can rise from two to six inches above the countertop, increasing the comfort level of users of various heights. To get the height just right for the sink’s primary users, a professional interior designer, plumber, or contractor can help you with your design and installation options. Easy to Install. Perhaps the easiest type of sink to install, they don’t require countertop cut-outs. It just needs a 1 3/4″ hole to accommodate the sink drain. Spacious. Many models—especially those made of clear glass—have an airy look; most models free up some counter space. Splashing. Though more prone to splashing, they don’t have to be. A professional can assist you with the proper faucet selection, height, reach, and placement of the faucet to minimizing splashing. Also, select a faucet equipped with an aerator, which will naturally create a non-splashing water stream. Cleaning. With two visible surfaces, it may require extra cleaning and maintenance. This is especially the case with glass and plastic, which can show water spots. To clean between the base of the sink and the countertop, homeowners and housekeepers quickly learn the simple “cleaning rag wedge” trick or use a long, thin brush to access this area. Price. Many people believe that they are more expensive than undermount sinks since they communicate high style, but as they have become more mainstream, the price options have changed significantly. Stability. If improperly installed, taller sinks may present stability issues and may not work well with young children, who will be tempted to grab on to the sides to pull themselves up. If you have your trustworthy plumber or contractor in your contacts list, this will be a non-issue. Likewise, a partially recessed installation can bolster a sink’s stability. Durability. Some sink models may be more prone to chipping or damage as the edge is exposed. This is not of concern with hardier materials such as copper and concrete.